The first principle of my blog is “Creating Ecosystems of Success” of which health and wellness are major aspects. Personal stories also fall under this principle as they are one of the most powerful means of teaching individuals about success and failure. Recently, three high schools in Northern Virginia hosted a very special guest who shared his life journey starting from his days as a high school basketball standout, to his college basketball stardom, to his ascension to the National Basketball Association (NBA), and then his personal struggles with drug addiction and substance abuse along the way. 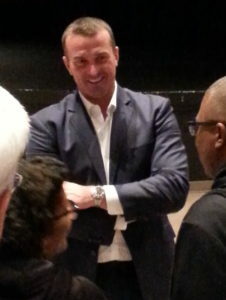 On Oct. 2 Chris Herren visited Northern Virginia to talk to students and families about his basketball journey and his lifelong struggle with drug addiction and substance abuse. 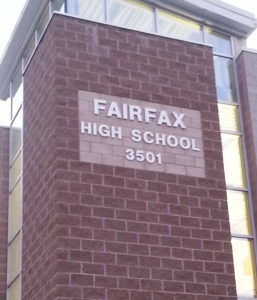 In the first of many local stops, Herren spoke at Fairfax High School to an audience of all students in the morning, and then to adults, families and the general public in the evening. I first heard part of Chris’s story years ago on the Jim Rome Show, and then I watched ESPN’s powerful documentary on his life and journey, Unguarded. 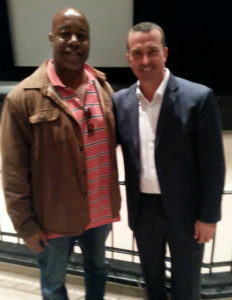 I learned about his visit a couple of weeks ago by chance after Tweeting to Chris’s foundation ‘The Herren Project’. I told them that I would’ve definitely attended one of his talks in Massachusetts if I lived there. They shared that he would be making an appearance in early October in the DC area, and as a lover of sports stories, I knew that I had to attend. 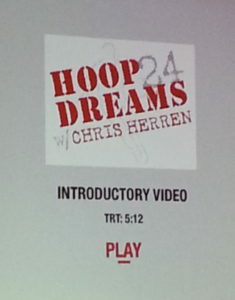 Chris Herren was one of the top 20 high school basketball players coming out of Durfee High School in 1994 with multiple offers to some of the nation’s top college basketball programs. It was in high school where he first experimented with alcohol – something he had seen his father do growing up. After playing just a little bit for Boston College, he failed a drug test which almost ended his career. He received a second chance from a legendary coach who had given numerous young men second chances throughout his career – legendary coach Jerry Tarkanian also known as “Tark the Shark”, who had taken over as head coach at Fresno State University where I first saw Chris play on television. There he played his way into being the 33rd overall pick for the Denver Nuggets in the 1999 NBA Draft. He was later traded to the Boston Celtics where his drug problems escalated, and then went on to play overseas in Italy where his life further spiraled downwards before setting off on his road to recovery years later. “The kids across the room who didn’t do anything, they had something I didn’t have,” Chris said in his strong New England accent, describing one of the high school parties he attended where he and his friends consumed alcohol underage, while another set of kids across the room didn’t consume anything and were fine with it. During his talk, Chris told many stories about his journey which involved experimentation and addiction to Cocaine, OxyContin, and finally Heroin – all while becoming a father and a professional basketball player. This particular story was significant because it touched on something many young people struggle with well into adulthood; personal contentment and self-esteem. The significance of Chris’s opening quote of this post is to get people to note where our personals problems start and their root causes, as opposed to focusing solely on the end results – substance abuse, drug overdoses, suicides, and many others. His just happened to be his father’s struggle with alcoholism, his mother’s resulting pain, and then the experimentation with drugs and alcohol amongst his peers early on as teens. Chris’s other over-arching message was about “Wellness”, and how both parents and schools need to be more vigilant and aware of the struggles of young people which can lead to any number of injurious outcomes later in life if not caught early and addressed. “Over the last seven years I’ve had the responsibility of sharing my story in front of a million kids. 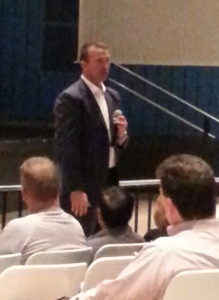 I truly believe in my heart that I’ve made a difference for some, and I do this for many reasons,” Chris Herren said opening up his talk. “When it comes to addiction, I think we’ve gone horribly wrong. I think we put way too much focus on the worst day, and we forget about the first day. After telling his story, Chris took questions from the audience – parents and teens, whom he also makes himself available to through email. Afterwards he graciously took pictures with those of us in the audience and took further questions individually. I seized the opportunity to ask him one to two more. If you’ve found value here and think it would benefit others, please share it and or leave a comment. To receive all of the most up to date content from the Big Words Blog Site, subscribe using the subscription box in the right-hand column in this post and throughout the site. Please visit my YouTube channel entitled, Big Discussions76. Lastly, follow me on Twitter at @BWArePowerful, on Instagram at @anwaryusef76, and at the Big Words Blog Site Facebook page. While my main areas of focus are Education, STEM and Financial Literacy, there are other blogs/sites I endorse which can be found on that particular page of my site. Hi anwaryusef.Great article.Drugs can cause many side effects, both psychologically, and physically, if taken improperly.I’ve read an article somewhere that addiction is one of the most dangerous side effects of taking adderall. Is it true? Hello Drug Education. 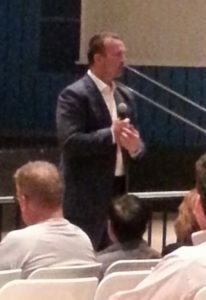 Thank you for commenting on my Chris Herren post. Even with my background in pharmacology, I don’t have much experience with Adderall. I did a quick search on it and it seems to be a mixture of amphetamine and dextroamphetamine. It seems that if you take a drug with a neuropharmacological mechanism of action, you will probably see some addiction and dependence develop after a while. The important thing is not to misuse these drugs. Thank you for the educational and entertaining interview. Historically speaking, you only hear about the drug abuse in minorities communities. This one is reaching into the general population and suddenly its a national crisis, and honestly speaking, it’s horrific for all of us. Articles like this one helps to spread the awareness. Keep them coming. Thank you for our comment Bufwendy. Yes when we think of drug abuse and addiction, the mainstream media often associates it with crime ridden inner-city neighborhoods. That said I’ve heard stories over the years of suburban kids falling victim to drugs as well. There are a lot of stories these days about the heroin epidemic being related to the loss of jobs and unemployment for ethnic groups who have traditionally not faced joblessness. It seems as though its important to be able to escape the pain of one’s circumstances. Hey there. Thanks for the great article!